VersatileDogs.com • View topic - Layout or mutt hut for your dog when waterfowl hunting? Layout or mutt hut for your dog when waterfowl hunting? This is my griff's first year hunting waterfowl and yesterday was her first day hunting geese which opened yesterday. It's the last opening for the season and the geese at this point of the season are pretty savvy. Just wondering ,,,,when you waterfowl hunt with your dog in the fields where do you like to conceal your dog when you're in your layout blind,,,,in the layout with you or in it's own mutt hut? 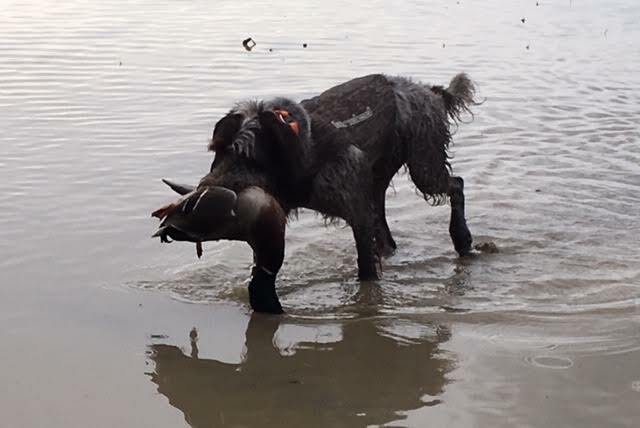 I've heard pros and cons for both, like not knowing exactly what your dog is doing while in it's own blind since you're totally concealed in yours,,,,, especially if it's a first year waterfowl dog. Do you think it would it be better to have your dog in the layout with you where it's possible that he/she might get in the way? I should mention that my layout is plenty wide enough that it easily holds me and my fifty pound griff. Just the same, I would have to think it might be dangerous keeping your dog in the layout because she might bump you while you're taking a shot.,,,,plus you might make your dog deaf if you're shooting that close to his ears. These are both major concerns for me. Can any of you back up these concerns with your own personal experience? I do own a dog blind for my dog and I can easily command her to go into it but as mentioned, since it's her first year hunting water fowl, will be her first time hunting geese, PLUS she hasn't used the mutt hut yet during a hunt, I don't know how steady she will be in it. She is totally steady in it when we do practice retrieving drills with dokkens and rubber dummies but being steady with flying birds and shooting is a whole other ball game. I really think she'll bust out of it as soon as she hears a shot. She's fine in a stand up/sit down blind in that scenario but it's a lot easier to control the dog in that situation. I'll also add that within five minutes of setting up the layout blind in my living room I had the dog kennelling into it, reliably. So after that my plan for the hunt yesterday was not to bother doing any of the shooting,,,,, at least for the first while, and let the other guys I go with take care of the fun stuff so I could just handle her, unless Sako caught on quickly. So yesterday has come and gone. Unfortunately, as luck would have it, even though there were some geese flying around and we had a good spread of decoys,,,,, complete with mechanical feeders, silhouettes, wind socks, etc. they chose other fields to go to. The dog was good in my layout. She easily went in and out on command. I had a four foot lead attached to her that was anchored to the back of the layout, just in case I did decide I was going to shoot and didn't want her to break. In any event, Ideally, I think I would rather have her in her own own blind, just in case a loss of hearing was at stake, but the other guys I was with said they would prefer their dogs in the layout with them. Have to say she kept me pretty warm in the -15 degree weather. LOL What would be your way to go,,,,, dog in the layout or the mutt hut? Any thoughts, suggestions, or advice would be greatly appreciated! Re: Layout or mutt hut for your dog when waterfowl hunting? MC, you have covered the pros and cons pretty well in your post. I like and use the separate "mutt hut" for the dog. My Dog's too big to be in the layout blind with me anyway. And we humans often hunt off of stools sitting inside of a panel blind with natural brush covering it. Having the dog in his own blind beside me at the end of the panel blind setup lets me watch him, lets him watch the action and mark falling birds and his blind keeps him a lot warmer than he would be otherwise. I find training and hunting the dog from his own separate blind is more versatile for differing setups which often do not include me hunting from a layout blind. You are on the right track on you dog handling and letting your buddies shoot until you have your dog trained to not break. Have fun, let us know how it goes. I put the dog in the blind, but under the sling pad behind my back. There is more room under there than you think. The dog lays there, and watches over my shoulder. When I sit up to shoot, the dog is safely behind me (and my hunting partners). It's also very easy to know when a dog is trying to break early and to correct it. It is true that when dogs are young, you'll miss some shooting opportunities while dealing with keeping the dog in the blind as they try to break before being sent. But I can't imagine that a dog in a separate blind would be less likely to break early, and correcting this is much easier IMO when the dog is literally pinned into the blind behind me. In the long run it's a good way to arrange things. I prefer the dog in a separate blind but do both. I let cover and concealment dictate what I do. I trained the required steadiness with a pinch collar and a very short lead. If the dog pulls against the check cord it corrects itself. Then proofed it with live flyers. Willie T wrote: I prefer the dog in a separate blind but do both. I let cover and concealment dictate what I do. I trained the required steadiness with a pinch collar and a very short lead. If the dog pulls against the check cord it corrects itself. Then proofed it with live flyers. This is what I did on Sunday. It's too bad not many birds flew our way. I was hoping to have a bunch of opportunities where I could throw open the flaps when the birds came in, let my partners do the shooting, and I would just make sure she stayed steady. I put one of those Starmark plastic prong collars around her neck but I could have also used the leather pinch collar, which I also own. Hopefully we'll get out this coming weekend but we just had well over a foot of snow come down the last couple of days. Too much could go wrong in a layout with a dog and a gun. It may be easier up front training not to break from a layout, but once they're trained for the mutt hut it's going to be better. Plus on a muddy day I'd rather not have a dog stepping over or on my gun or other stuff. Ill have to vote for Mutt Hut. I finally got to get out this season. Im in the willamette Valley in Oregon and our birds here are extremly educated. We hunt open grass seed fields. We cant hide in the decoys, we have to find some type of edge or cover to set up. And the decoys are out quite aways. Today we had a ditch with about 3 foot tall weeds. We couldnt get the layout blinds completely out of the field. So we backed them up as much as possible and tried to blend them into the edge. We got done setting up and I asked my friend where his dogs blind was. He pointed about 50 feet down the ditch and I had to walk down and it was almost impossible to see the dogs blind. Its a huge advantage to have the dog steady in the his blind remotely. Sometimes we have the dog away from us on high ground while we stand in the water. Sometimes the Hutt makes it easier to put the dog where he can mark birds. Sounds like youve done a good job prepping. I would add what Willie T suggested. I set up the Mutt Hut, put out decoys, put the pigeon launchers in the decoys and sat down in a chair and blew the calls, stopped, yelled take em! Popped a bird and shot it. Never used a dog blind, never a problem. I either lay the dog right next to the blind with no cover, or throw a piece of caco cloth over her. They're the color of dirt so don't need their own blind. A separate blind is a pita and just gives you more to hide. I just hate seeing birds die of natural causes unless I'm that natural cause. My dog blind has a pad which provides insulation for the dog vs laying on the frozen ground and the blind keeps the wind off the dog as well. Definitely more to carry and hide, but worth it for those reasons, for me and my dogs. AverageGuy wrote: My dog blind has a pad which provides insulation for the dog vs laying on the frozen ground and the blind keeps the wind off the dog as well. Definitely more to carry and hide, but worth it for those reasons, for me and my dogs. When I'm in really cold weather I just lay a short sleeping bag pad on the ground. GONEHUNTIN' wrote: Never used a dog blind, never a problem. I either lay the dog right next to the blind with no cover, or throw a piece of camo cloth over her. They're the color of dirt so don't need their own blind. A separate blind is a pita and just gives you more to hide. This morning we were out in a foot of snow and we had blind set up built out of white sheets and sat on stools for pass shooting,,,,,,birds coming off the river and heading towards the fields where we're not allowed to shoot. Had the dog inside with us. Unfortunately, the geese did not cooperate ,,,,the only water fowl that's open right now. They decided on another fly by passage this morning. The ducks, on the other hand, were coming by us left, right, and centre. It gave the dog lots of opportunity just to watch the sky, the birds, and just being steady sitting in the blind. Sure would have been nice being able to shoot to give her more practice to being steady to shot in a real life hunting situation. So I guess if we were in a similar situation using white layout blinds you could just put a white sheet over your dog beside you but it sure seems like it would be easier just to have the white cover on the mutt hut and telling her to kennel up each time she comes back. She's really good about going in there, although she likes to keep her head and front legs just outside the blind,,,, but she is still. Is it okay to have this first year water fowl dog hanging out the front of her blind a little like that,,,,or should I be adamant about having her totally concealed within the dog blind?? My friends dog is 5, but has been steady from its first hunt. As far as how much dog can show? I like the dog to be able to see whats going on, so I dont mind them peeking, I will add cover over the opening so they are not fully exposed. But if you want them totally inside, establish the standard and stick to it. Gonehuntin is correct to a certain extent. Birds tend not notice the dog so much, so I want them hidden, but able to see. Our geese here are a different story, especially by our third season. Most of these birds have been here multiple years. They have been shot at multiple times. A dog the color of dirt would be spotted. Early in the season you could probably get away with it. There were about 4000 birds the day before our hunt yesterday. I would have to say most of those birds came back. sometimes in groups of 30, sometimes hundreds. We were clearly where they wanted to be, they would circle 6 or 7 times and look like they were going to land, we even had a few that did set down, but the big groups knew something wasnt right. They would circle right over the top of us, get closer to the ground as they passed over the decoys, then as they came back to the ditch they would climb. Then they would just leave. We ended up deciding that we had to just take them at 35 yards or so instead of getting them down. But every time over the blinds we had all those eyes watching. So having the dog in his blind completely hidden was a great advantage. I dont know how retrieve happy your dog is with bumpers, but set the blind up and my dog goes nuts because she knows its fun time. So she has lots of time getting in the kennel, retrieving bumpers. i will move off 50 yards or so from the blind, have her retrieve the bumper to me and then send her back to the kennel. I want her to know that if shes coming back with a goose and i say kennel, i want her to take the bird to her kennel. sometimes we have more birds coming and I need her in her blind. check out this youtube video. https://www.youtube.com/watch?v=leKKTcDZaME About 7 years ago and we had more restrictive rules. We couldnt shoot till 8 am. The dog is my friends dog that passed away. But all our dogs can do this. at the end you see they sent the dog out to move the birds. They leave but they dont really worry about dogs so much so they return in smaller groups.